A Volvo has always been a comfortable and safe car. Since the introduction for the Volvo S60 there is a compact sedan with a coupé look in Volvo’s product range that carries the torch from the Amazon Sport of the sixties but with performance levels well in line with the most powerful cars of the 21st century. Volvo S60 is not just an outstanding touring car or a flexible family car. It is also a competitive racing car, something it has proved in both the STCC (Swedish Touring Car Championship) and the ETCC (European Touring Car Championship). 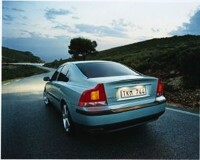 Introduced in year 2000 Volvo S60 appeared in an updated version during 2004. This includes a new rounder shape of the front end with new grille and bumper as well as new lights front and rear, a more powerful engine for T5 and a six speed manual transmission. The advanced electronically controlled chassis system FOUR-C is made available for Volvo S60. The Volvo S60 has a sloping roof line, swept-back C-posts and short rear section – a combination of sedan and coupé design that gives the car its sporty appearance. In order to further emphasise the Volvo S60 model’s sporty profile, the nose section has been extended, the haunches are more pronounced and the body has a ground-hugging stance. The body of the Volvo S60 features immense torsional rigidity and the car has a sturdy chassis, a combination that results in consistent, predictable behaviour on the road (see also under "Powertrain and Chassis"). Volvo Cars has developed various information systems designed to help the driver while on the move. Petrol engines with low internal friction, efficient combustion and advanced exhaust filtration technology result in low emissions. Energy-efficient diesel engines with particle filters produce low emissions of carbon dioxide and soot particles. Methane-powered Bi-Fuel cars with petrol as the back-up fuel reduce carbon dioxide emissions by 25% compared with petrol-only cars, if the methane is extracted from natural gas. When running on biogas, the net greenhouse effect is instead virtually zero. The engines in the Volvo S60 can be optionally specified with a catalytic radiator coating known as PremAir®. This system converts harmful ground-level ozone into pure oxygen as the car drives. Its benefits are greatest in dense city traffic and in strong sunlight. Below are links to various Volvo S60 pages and web sites that have a wealth of general and technical information on the Volvo S60. Volvo Brochures. These contain technical and general specifications. Superchips. Improve the performance of your car with a new ECU chip. Volvo 2002. Photos, Specifications, Prices and Options for the 2002 year model. Volvo 2003. Photos, Specifications, Prices and Options for the 2003 year model in North America. S60 2003 Model Year UK. Full details about the UK S60 2003 year model. Information, pricing and specifications for the S60 Model Year 2005. See Press Kits from this link. Accessories for the current range of cars. Volvo S60 Concept. A taste of the spectacular all-new Volvo. Volvo S60 2008 Technical Specifications. Volvo S60 2009 Technical Specifications. Volvo S60 2011 Technical Specifications. Volvo S60 2012 Technical Specifications. Volvo S60 2013 Technical Specifications. Volvo S60 2014 Technical Specifications. Volvo S60 2015 Technical Specifications. Volvo S60 2016 Technical Specifications. Volvo S60 2017 Technical Specifications. Volvo S60 2018 Technical Specifications. Volvo S60 2019 Technical Specifications. Volvo S60 2020 Technical Specifications.